Commonly knows as Dwarf Mat Rush or Longleaf Mat Rush, the Lomandra longifolia Breeze, is loved by many because its unique and unusual appeal can beautify even less-than-ideal areas when using an ornamental grass in landscaping. Compared to the Grass Trees of Australia, Lomandra longifolia Breeze displays a compact growth habit and is much smaller as it reaches 24 to 40 inches tall. Lomandra longifolia Breeze boasts a fine-leafed spread of shiny evergreen strap-like thick leaves. A closer look at each narrow leaf will let you see a unique kind of cut at its tips. This plant bears tiny creamy yellow flowers that smell like sweet honey in the afternoon. Although most grasses are found outdoors especially on areas where they are less appreciated, Lomandra longifolia Breeze is very much suitable for growing indoors. It looks equally beautiful like other foliage plants when grown in pots or containers. 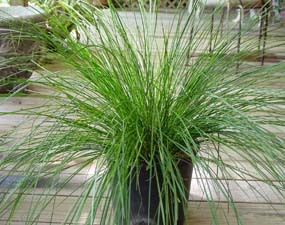 Because Lomandra longifolia Breeze is drought-tolerant, it is highly recommended for xeriscaping. Many landscapers and gardeners find it an ideal choice for grass landscaping and for specimen plantings.